Astronomers have been finding exo-planets (planets outside of our solar system) willy nilly in recent years, but now they’ve found one right in our back-yard, galactically speaking. 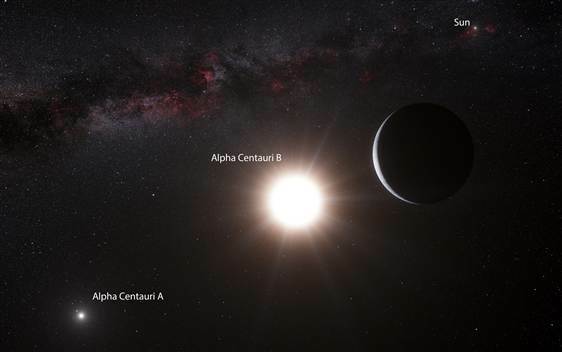 It turns out that there is a planet with an Earthlike mass orbiting Alpha Centauri B, part of a three-star system located a mere 4.3 light years from our home system. Even more exciting? Its presence suggests there may be other worlds to discover in the system, possibly even falling within the system’s “habitable zone,” which would allow for the presence of liquid water. The science folks have given the world the entirely uninspiring name of “Alpha Centauri Bb,” which I can only hope some member of the media will pronounce as “Alpha Centauri Bu-buh” at some point in the next week. Still, I’ll forgive them their naming deficiencies since this discovery is too cool for me to effectively mock. I’ve been dreaming about planets orbiting Alpha Centauri for pretty much as long as I knew what Alpha Centauri was. Now if we can just find some native Centauri (no, not that guy). Stephanie Udry of the Geneva Observatory, one of the study’s co-authors, explains that this discovery “opens really good prospects for detecting planets in the habitable zone in a system that is very close to us.” In other words, we might — might — find a planet there that could conceivably be visited or even colonized, assuming we can figure out a way to get a ship there in less time than it would take for the crew to grow old and die en route. A long-shot? Sure. Does the thought still make me giggle uncontrollably? You betcha. So, what do we know about Planet X? As reported by MSNBC, it orbits its star every 3.2 solar days, and it orbits at a distance of 3.6 million miles. Compare that to Earth’s 93 million miles from our sun and you shouldn’t be surprised to learn that Planet X is believed to be a rocky world with a scorching surface temperature of around 2,240 degrees Fahrenheit (1,227 degrees Celsius). Needless to say, Planet X is not a good prospect for finding little green men. In fact, the surface may be entirely molten. There you have it. NASA’s working on warp drive, James Cameron is planning to mine asteroids, and now we’ve found a planet in our neighboring star system. The future is seeming just a little bit closer these days, isn’t it? How could it be habitable or colonized if the surface is molten? This article doesn’t make sense. That’s because we didn’t say the planet they found is colonizable. We said it increases the possibility that they’ll find other planets in the system, some of which could exist within the habitable zone. Anybody else notice that this article came out 15 years to the day after the official launch date for the Jupiter 2?